From left: Max Pfleghar and Bridget Paulmann, Spanish 6 students at Fairfield Ludlowe High School, will be taking the STAMP test April 4. 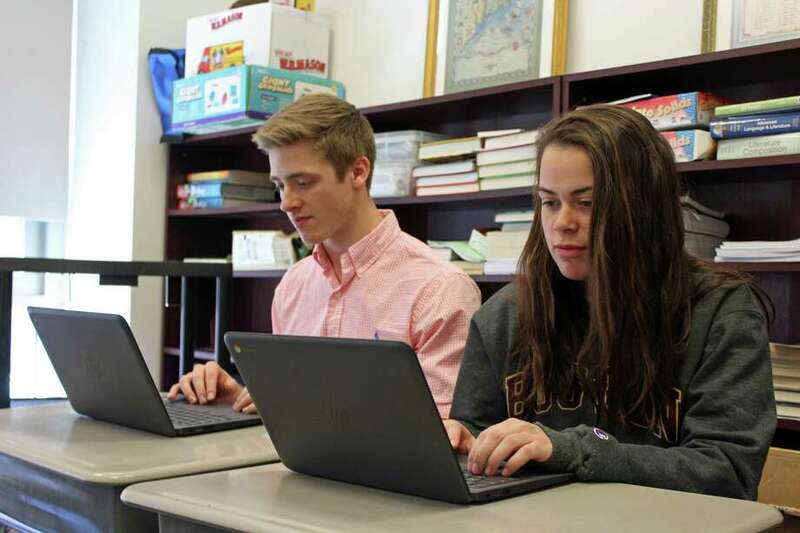 FAIRFIELD — Bridget Paulmann and Max Pfleghar, both 18-year-old high school seniors at Ludlowe, have been learning Spanish since elementary school. On April 4, they, along with nearly 50 other Spanish students at Ludlowe, took the first half of the Standards-based Measurement of Proficiency Test, a way of earning the state’s Seal of Biliteracy on their high school diplomas and transcripts. Frankel, the Advanced Placement Spanish teacher at Ludlowe for more than 10 years, has refocused the curriculum to encourage students to use their Spanish skills to engage with others, regardless of small or minor errors. For Frankel, it’s more about expressing oneself rather than memorization. Students must fulfill two requirements for recognition: complete all English language studies for graduation and a minimum score on one of many different language examinations. For the STAMP test, students must obtain an “Intermediate Mid” score to demonstrate their foreign language proficiency. “(The Biliteracy Seal) is going to be a useful tool for juniors as they’re applying to school and it looks good on a college application,” Pfleghar said. Paulmann is, for now, set on pursuing international economics and is “definitely” looking to study abroad while in college. Though a score of 3 or higher on language AP exams are validated toward the biliteracy seal, exam scores will not be received until after graduation, Frankel said. That’s why students taking the STAMP test this week will be eligible to obtain the biliteracy mark once scores are received in approximately a month’s time. Students enrolled in Italian, Latin, Mandarin Chinese and French will also be eligible to obtain biliteracy recognition.